Persistence Market Research delivers yet another unbiased, comprehensive and insightful report titled ‘Professional Services Robots Market: Global Industry Analysis (2012-2016) and Forecast (2017-2022)’. In this report, the global professional services robots market is explored in great detail, and the market dynamics of the global professional services robots market has been covered comprehensively, explaining to the report readers the drivers, restraints and trends operating in this highly competitive market. Also, analysis of the data over different parameters has been done in order to arrive at market numbers concerning the global professional services robots market. Besides, competition landscape of the global professional services robots market is also covered in this report, giving information about the key companies operating in the global professional services robots market. 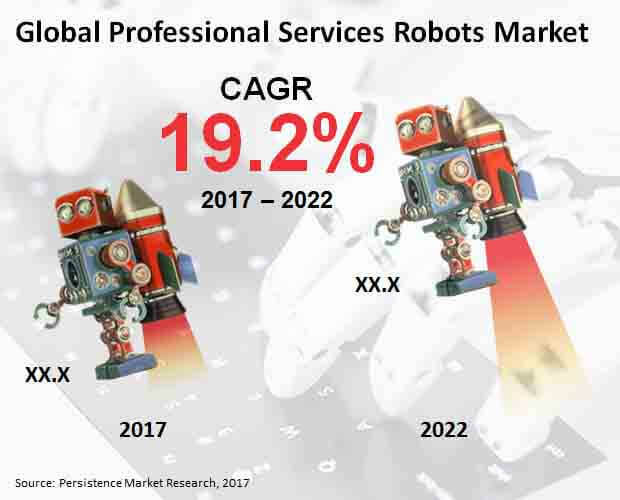 Persistence Market Research leverages a proven and tested research methodology to determine the revenue estimations of the global professional services robots market. In-depth secondary research is used to arrive at the overall market size and top industry players. A list of industry players (manufacturers), distributors, retailers, and industry experts is developed along with a comprehensive discussion guide for detailed and exhaustive primary interviews. Data thus obtained is validated using the triangulation method, where primary and secondary research along with Persistence Market Research analysis contribute to the final data. This data is then scrutinized using advanced tools to glean pertinent insights into the global professional services robots market.